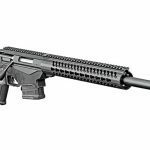 At the range, the Ruger Precision Rifle balanced well even in unsupported kneeling and seated shooting positions. It also ran smoothly and produced tight groups. Thanks to a patent-pending design, the rifle can accept several magazine types, and the front of the magazine well has a hook for bracing against shooting supports. 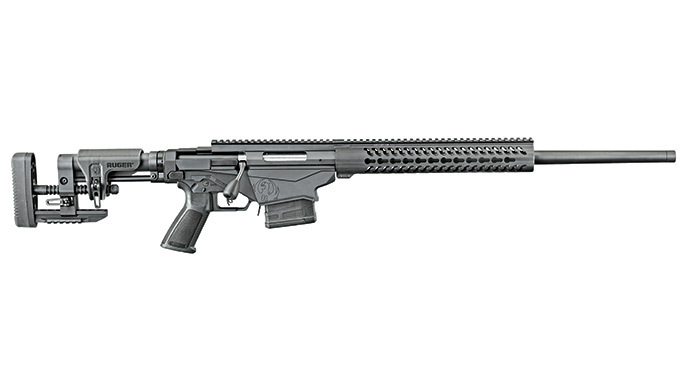 Ruger’s MSR stock, adjustable for cheek height and length of pull, features a thick rubber buttpad and a bottom rail. Also note the folding stock hinge, which can accept AR-style buttstocks. The long Picatinny top rail makes it easy to add optics as well as night vision and other accessories. Also note the rifle’s unique upper and lower design and enlarged, easy-to-run bolt handle. 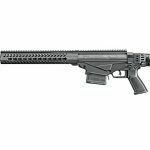 Available in 7.62mm/.308 Winchester, 6.5 Creedmoor and .243 Winchester, Ruger’s Precision Rifle comes with a left-side-folding stock for easier storage and transport. For many shooters, the precision rifle world is just too expensive. The same is true of the competition arena. While there are some “starter” rifles available, they are moderately accurate, requiring a significant investment. What today’s operators really need is a solid rifle that does not require a second mortgage to buy. Of course, Ruger has come to the rescue. I attended a Ruger media event a while back where the company had a prototype of a tactical precision rifle for testing. It was a simple rifle with a laminate stock and a bull barrel, outfitted with a nice scope and a bipod. Shooting from prone at 100 yards, it put five rounds of hunting ammunition into a 0.6-inch group. Expressing my pleasure, I suggested to the Ruger representatives that the rifle needed to be in 6.5 Creedmoor, preferably using a tactical rifle stock. But even as it was built, it was fun to shoot. I asked when it would come out, but the representatives said it may not—it was just an experiment. A few months later, I received an invitation from Ruger to test the company’s new precision rifle. Of course, I thought it was the same rifle I had tested earlier, and accepted. I flew out to the FTW Ranch in the Hill Country of Texas, where the new Ruger Precision Rifle was unveiled. I have no doubt my jaw dropped when I first saw it. It wasn’t a remake of an old rifle. 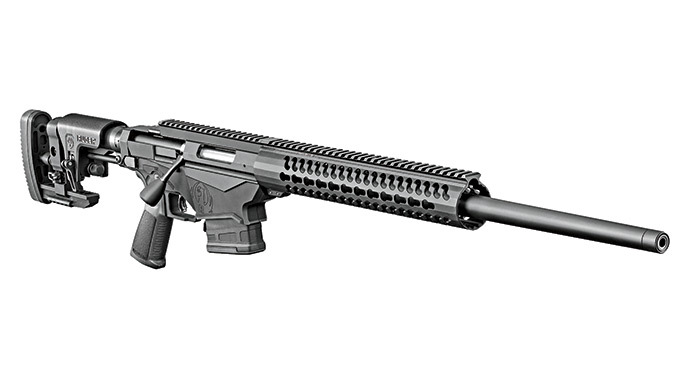 The Ruger Precision Rifle is built to meet the needs of just about any marksman, and it’s about as far from a “typical” Ruger as you can get. It was as if Ruger’s engineers had built an entry-level rifle exactly the way I wanted. 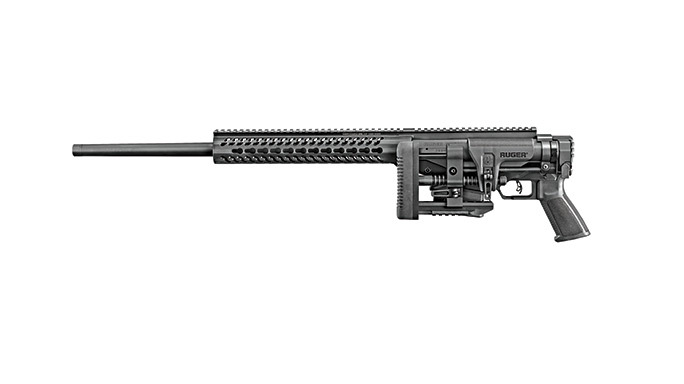 Ruger’s lead design engineer on the project is an avid shooter, and he put tons of thought into this rifle’s operation. The result is a fantastic rifle designed from the ground up to meet the needs of every precision rifle user. It’s not just a barreled action in a stock—it’s purpose-built with input from today’s shooters. To that end, most everything on this rifle can be taken down with simple tools in the field, including the bolt. Ruger started with the American rifle’s proven 70-degree, three-lug bolt and built an “upper receiver” around it. With its enlarged bolt knob, the bolt is very smooth and fast to manipulate. The bolt and upper assembly are CNC-machined from pre-hardened 4140 chrome-moly steel. The receiver comes with 20-MOA Picatinny top rail for mounting optics and sights. The barrel is cold-hammer forged from 4140 chrome-moly steel with a medium taper and 5R rifling. It also features a match-grade chamber with minimum headspacing. I was able to test a 6.5 Creedmoor rifle with a 24-inch barrel, but the rifle is also available in .308 Winchester with a 20-inch, 1-in-10-twist barrel and .243 Winchester with a 26-inch, 1-in-7.7-inch barrel. The 5/8×24-threaded barrels come with thread protectors and can be removed using standard AR tools. Users can also install AR-style handguards. Surrounding the rifle’s barrel is a long Samson Evolution handguard. The upper is mated to a 7075-T6 aluminum lower that accepts SR-25 and AICS-pattern magazines. Ruger’s patent-pending universal magazine catch and extended paddle ejects both magazine types without requiring any modifications. The front of the mag well features a hook for using the rifle on barricades or around other obstacles. At the rear of the receiver is a folding mechanism with a standard carbine buffer tube. The Ruger stock, also made in-house, is easy to adjust for both length of pull and cheek height without tools. Users can also install an aftermarket AR stock if so desired. You can also install your favorite AR pistol grip if needed. 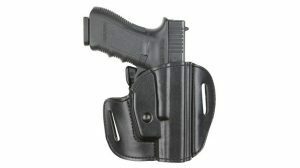 The extended, 45-degree safety is placed in a position similar to an AR’s, and it can be reversed for left-handed shooters. The Marksman adjustable trigger offers a crisp release and can be adjusted from 2.25 to 5 pounds using a wrench stored in the rifle’s bolt shroud. A Burris XTR-II 5-25x50mm scope was mounted for testing. Priced at about a grand, this is a mid-range scope with clear optics, a first-focal-plane reticle and easy-to-use adjustment knobs. Atlas’ excellent and proven bipod was provided along with a Tab Gear sling. 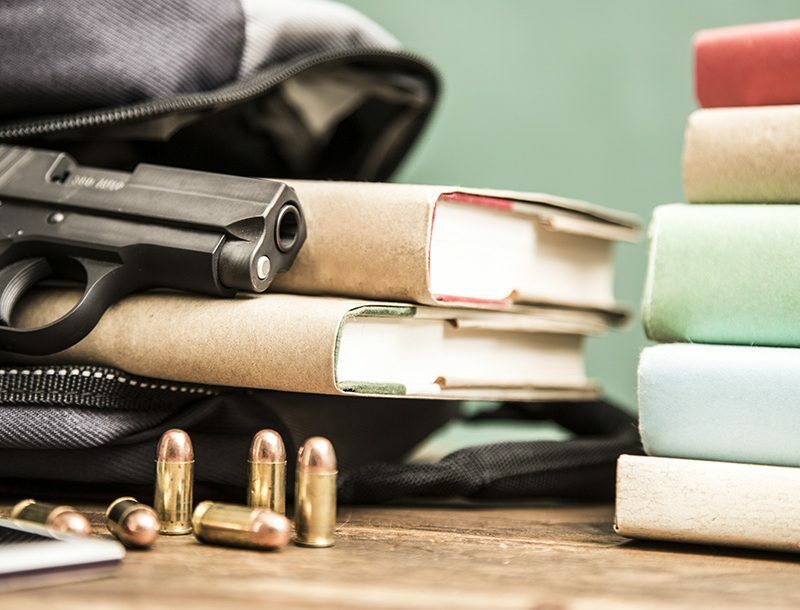 Each writer at the event was assigned a rifle that they would use throughout FTW’s Sportsman’s All-weather All-terrain Marksmanship (SAAM) class and then take home for further testing. The rolling hills and sharp elevation changes at FTW Ranch allow for shots out to a mile if needed, while its state-of-the-art ranges provide for 100-yard shooting as well as unique moving targets shaped like dangerous game. The SAAM class prepares hunters for upcoming big-game hunts. The staff also host many military units tasked with sniper duties in preparation for deployments. Our lead instructors were both former Navy SEALs who had spent years in combat and training military snipers. Over the course of three days, we expended hundreds of rounds from 100 to 1,500 yards on steel targets of various sizes. Once zeroed, my first three-shot group at 100 yards measured a mere 0.38 inches. In fact, throughout the entire course, my worst group only measured about 0.5 inches. The rifle was also never cleaned, and it did not exhibit any degradation of accuracy over the entire course. Shooting Hornady’s 140-grain A-MAX ammo, this rifle maintained the kind of accuracy you’d expect from rifles that cost three or four times more. Moving out to multiple ranges extending to 600 yards, it was almost too easy to make hits. If I did my part and read the wind correctly, almost every shot was a hit. At the long-range deck, I was able to get a first-round hit at 1,000 yards. There was no vertical stringing under rapid fire, and the rifle held its zero throughout the course. The bolt was smooth and incredibly fast, and it never missed a beat. Ejection was also consistent, creating a little pile of spent cases nearby. The rifle ran flawlessly with both 10-round PMAGs and AICS-style magazines. Both also dropped free easily during reloads. If you already have a supply of expensive metal AICS mags, you’re good to go, but the $15 PMAGs worked just fine, too. the course. The stock folds to the left side and optionally locks in place. Once locked open, it’s very solid, with no movement to speak of. Cleaning the rifle is also simple; just fold the stock, remove the bolt and go to work. I moved my rifle’s safety to the right side to facilitate using my strong-hand thumb, and the safety was positive and easy to reach. The trigger, with its built-in safety toggle, takes some getting used to, but it was very crisp and consistent during testing. After getting back home, I tested the rifle with three different loads. Hornady won the day with a best five-shot group measuring 0.4 inches at 100 yards. The other groups were around 0.5 inches wide. Adding my Delta P Design Brevis II Ultra 6.5mm suppressor, the recoil was practically non-existent. Plenty quiet, this suppressor adds 7.5 ounces to the end of the barrel. 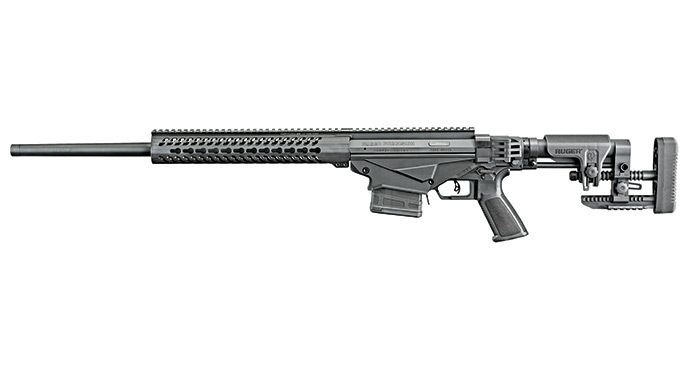 It’s also designed specifically for Pro Series competition, and it was perfect for this rifle. The stock’s straight-line design sends the recoil directly to the rear, making it easy to make fast follow-up shots. The bolt handle’s location and lift are just about perfect for me, so it was easy to stay locked into my shooting position. 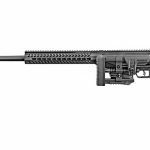 How it fits, the trigger, the smooth operation—everything about this rifle is conducive to accuracy. 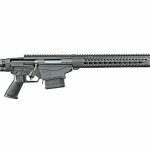 Ruger’s Precision Rifle is just downright impressive. Its accuracy was excellent, its ergonomics were solid, and it was completely reliable. The rifle’s ability to accept SR-25 and AICS magazines interchangeably makes it incredibly versatile. 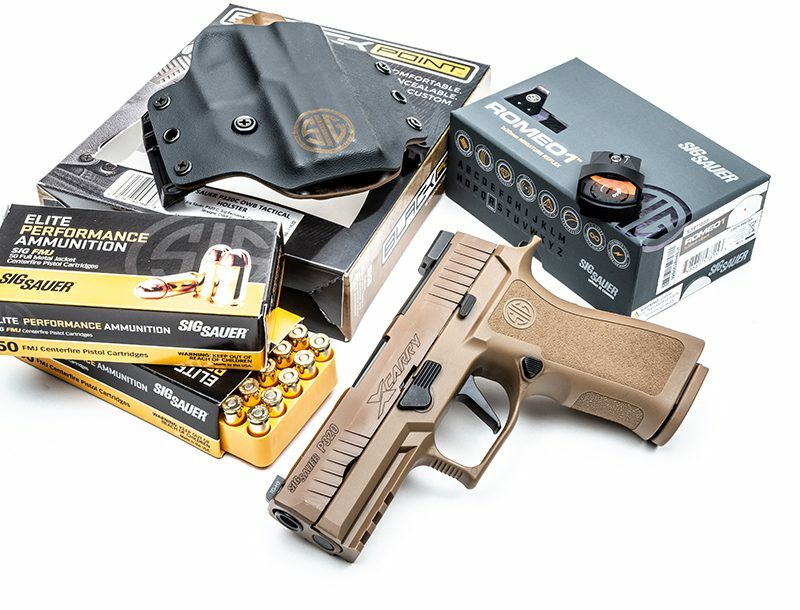 You don’t have to spend $90 on a magazine. And because the rifle accepts other handguards, grips and stocks, you can outfit the rifle exactly to fit your preferences. Getting all of this at an MSRP of $1,399 is a bit mind boggling. The Precision Rifle is a fantastic choice for most shooters. 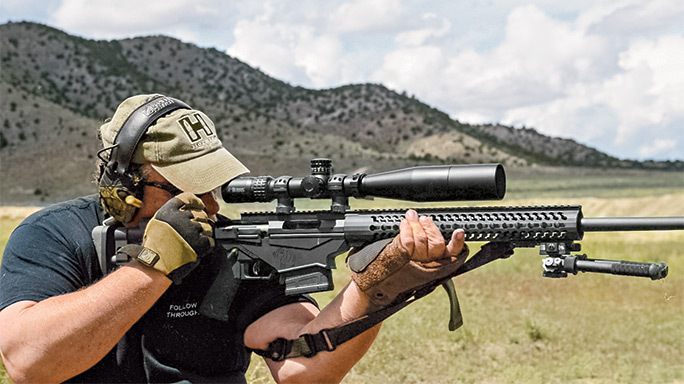 What’s not to like about the Ruger Precision Rifle? I’m certainly going to keep my test rifle. I might even take it to a match or two, maybe even a PRS match. 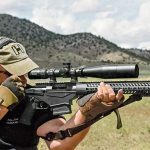 One thing is certain: The Ruger Precision Rifle is going to open up the precision rifle world to many new shooters, and that is fantastic!